After one air compressor failed and two air spring leaked, I've had enough with Mercedes unreliable air suspension and I'm glad I didn't buy the R-class with full airmatic. Anyways, it took me serveral hours searching for parts online and multiple visits to part counters before I came up with a perfect combination. 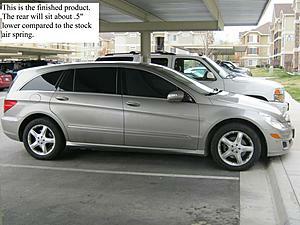 Apparently, Mercedes sells R-class with coil spring on all four corners for the rest of the world but not in US. So, when I took the part number (2513240004) for rear coil spring over to MB dealer, they could not order it because it's not meant for US vehicles. I thought I hit a brickwall...but after a lot of research, I found that Mercedes shared some platform with the new Jeep Grand Cherokee which my buddy own one. I peeked under his car and I saw the same suspension setup...some parts even have Mercedes number on it. After some mix & match, I finally finished my project and I'm very happy with the result. - Spring Compressor. I tried 3 different spring compressors from autozone and pepboys but none of them work, so don't waste you time on those. You need to get a special MB spring compressor from MB dealer or ebay. - My air spring already developed a leak, so I just pulled the air compressor relay and left it overnight for the suspension to bottom out. - Jack up the car and take the rear wheel off. - Disconnect the air line on top of the air spring. Plug the line and tug it inside the wheel well. 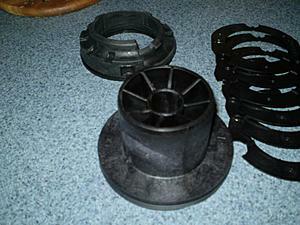 - Pry the air spring out. You have to break the plastic clip (211 328 00 58) on the top and put a new one on. - Compress the new coil spring with the special tool. It took me a while to get it right. If you position the plates too far apart, it'll stuck when you try to release it. 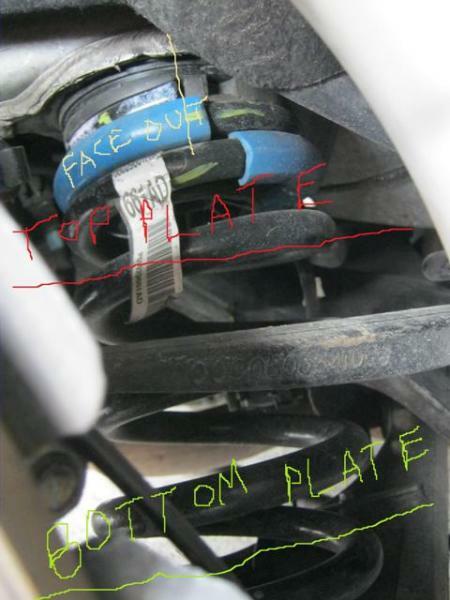 On the other hand, if you postition the plates are too close together, the spring won't be short enough to get in between the control arm and the body. Please see the picture for reference. - The upper retainer comes with stacking shims. So, you can select how high you want the car to sit on. I only left one thinest shim on it because I don't put that much load on the rear. - Now, put the upper and lower retainers on the compressed spring. Then work the whole assembly in between the body and lower control arm. - The top end of the spring has to face toward the outside of the car. - Make sure that everything is in correct position before you start to release tension. Once the upper retainer pop in, there is no return. The only way to get it out again is to break the clip. - Release the tension slowly and keep you eyes on it...make sure that everthing goes where you want it to be. - Now, disconnect the arm from ride height sensor with 10mm socket and tie it at 90 degree angle with zip ties. This will trick the computer, so it won't try to compensate for different load level and give you 'visit workshop light' on the dash. - Put the wheel back and go for a test drive. Make sure that the spring seats correctly. - Now, enjoy the R without the hassle of stupid air suspension! PS...I did not take any picture during my DIY because I don't want to get my new cam dirty. All I have is the finish pictures, but it's pretty straight forward...just takes some elbow grease and ice cold 6-pack! Nice work. Good to know that here are other options out there. Wow, you are a ballsy badass! Very good to know if (more like WHEN) the time comes. Any error messages from the computer? No error message at all if you disconnect ride height sensor arms. I actually left the arms intact for the first week and kept getting white 'visit workshop' light after a few miles of driving because rear suspension doesn't react with the adding air. So, you won't get any error if you follow my instruction. Dammit - I really needed to read this post a week ago when I ordered replacement Arnott bags. I will definitely go this route if (when) the pump fails..
PARTS: Order by sales code. Does anyone know if it is code ZPR or ZBR? I ran into the same problem too when I looked online. Actually, it doesn't matter...as long as you put the correct part number, either code will give you the same spring. I just had the air bags replaced in my 2006 R500 with coils from a 2011JeepGrandCherokee. I ordered the parts and gave the instructions noted on page one of this post to a local, independent repair garage and it took them about 2 hours to do the work. Total cost of parts, labor and customs fees on the parts was $658 Canadian. So nice not to have to worry about air suspension issues again. Thanks to UtahKompressor for sharing! You're very welcome...glad to hear that you fixed the problem! Is the rear coil conversion an option if i have the full Airmatic option? I don't think it's gonna work because all four corners go up and down together. Plus, the computer will throw errors when you push the airmatic switch. Unless you don't give a sh#t about warning light, you can do whatever you want. Thanks for the reply. I wound up buying a set or rear air springs from Arnott and had a local indy shop in Salt Lake put them on. Cost me a tad over $500 in parts and labor, but it beat the dealership by a $1000. @Utahkompressor... 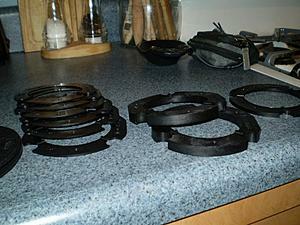 Please help me chose the correct shims. I can't believe how many they give you with the upper mounts! My original thoughts on the used springs I got were wrong. They don't fit the bottom mount. I went a different route and will post up what I did once they are installed. It is still a coil spring conversion, though. So, what darn shim to use??? I'm thinking one thick one? Last edited by josworth; 01-06-2013 at 06:50 PM. So, my conversion is complete. I now have rear coil springs in the R350. One difference, I didn't use Jeep Grand Cherokee springs.. Well, I'm sure I did, I just didn't buy them from a Jeep dealer. I got them from a Mercedes dealer instead. 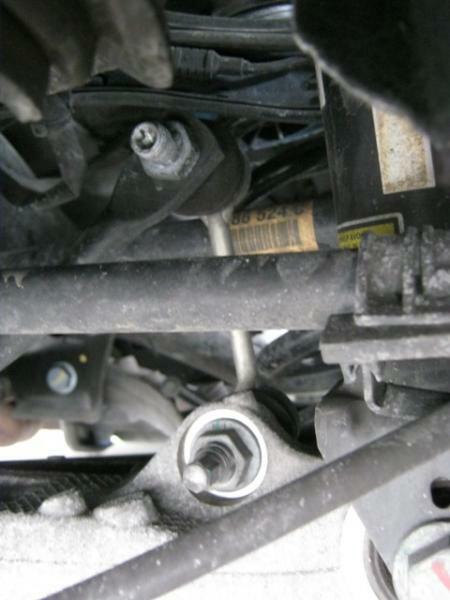 See, the coils in the 2011 and up Grand Cherokee are also the same as the coils in a M Class as well. 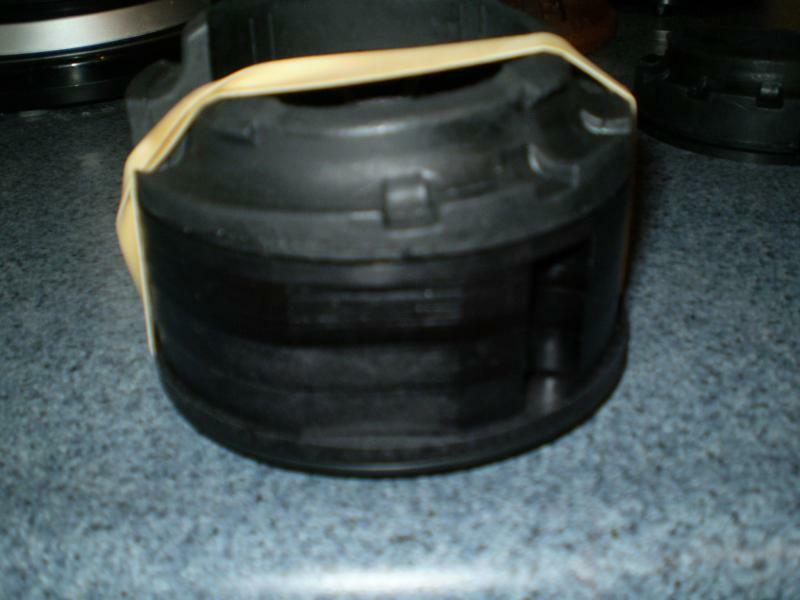 I purchased part number 164 324 02 04. I actually got them cheaper @104 each than the Jeep part number. At least from what I could find. Also, any Jeep place I contacted said they were special order???????????? The Mercedes, not so. 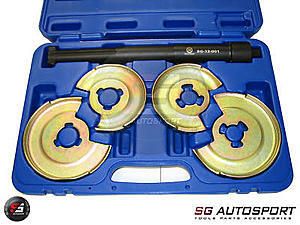 Also, I was able to install them without using the special Mercedes spring compressor. I used the free loaner one you can get from Auto Zone. It has hooks on a block on top, a long center bolt and a lower fork looking plate. I does become a two person job when using this spring compressor. The most steps listed above are the same.... Here are the changes / what I did. Demo both sides. I also removed the sensors (two 8mm head bolts) so they didn't risk being damaged during the install. The normal spring compressor will not fit up through the bottom of the coil. So, you need to unbolt the block from the main bolt. Slide the block in from the side of the coil and place the hooks at the highest point you can with the top plate mounted. Slide the fork plate in as it's supposed to go at the lowest point possible. Tighten the bolt the most you can, to where the bolt almost touches the plastic top mount. Now, unbolt the shock from the lower control arm. Yup! Now is when you will need a helper. From the top by the brake disc, lower the spring assembly into the lower control arm. Then the helper takes a pry bar and pulls down the lower control arm. There are different grab points. Be careful of the rubber boots on various joints back there, but you will see, it really doesn't take a lot of force to pull down the arm enough. While forcing the arm down set the spring assembly centered on the plastic pin and have the helper release the lower control arm slowly. Pop, in it goes. You will want to reverse the spring compressor next. Don't bolt the shocks up yet. 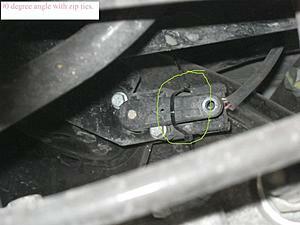 Once you have the center bolt out just finagle the hook block out the side of the spring the same way you got it in. It pays to practice a couple of times with just the spring so you don't get stuck messing with it in the car. Ask me how I know this...LOL. Also, you may need a screwdriver to pry the hook a bit at the top if it feels stuck against the mount. Just double check your alignment and it will go just fine. Once the spring is clear, take your jack and jack up the lower control arm just enough to get the shock bolted back on. That's it. No special tools required. As for the shim question, I used the one single middle shim. The one pictured on the far right of the picture above. It sits maybe a little higher than stock, but once the spring settles it should be totally level. It looked darn near perfect after two test drives. Don't forget to set the level sensors like explained in the first post. Again, two road tests... on some bumpy roads as well, and no warning lamps either. I am soooo happy that we won't ever have to deal with that friggen air suspension ever again. I did notice that the shocks were wet, so guess what is next... Wooo Hooo..
Utahkompressor and josworth, thank you for your posts. 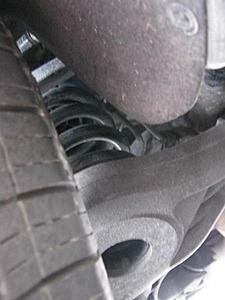 Passenger side was sagging this morning and after reading this, I believe coils are the answer. Technology is nice, but sometimes less is more. Question is: after some time with the coils, any issues? How's the ride? ... Are there shocks anyway? I too was concerned about that. It rides just as good with the coils. Remember, I replaced the rear shocks as well, so I'm sure that helped. Pay close attention to the shim conversation because that will impact ride height. Also, long term, despite tying up the sensors just like Utahkompressor, I will occasionally get a momentary error message with the car/arrow graphic. It only happens when I have people in the back and go up a driveway or something. So, I think there may be more sensors than just the ride height ones. Also, my compressor does come on now and then. Don't bother trying to unplug it, you will get the "nasty red" visit workshop message. I am going to eventually look at how to possibly trick the computer electrically to think the compressor is there. If I figure it out I will post here. Good luck with the install and trust me it is great knowing that I wont have to worry about any of those components ever again. Any other questions, just ask. Even though I am not on here that often, I do get e-mail alerts. My compressor also come on, usually cold start in the morning...which is pretty annoying. Unplugging it will throw the red visit workshop because you break the loop of CAN connection. However, after I read the wiring diagram, tricking this computer is easier than I thought. The only thing you need to do is pull the fuse for the air compressor. It is the big orange 40A fuse in the front fuse box (next to the coolant reservoir) and there is only one of them in that box, so you should miss it. Apparently, the computer doesn't care whether the compressor is actually on or not, it just wants to know that the compressor is still in the loop. With that said, other model years might be different because on the wiring diagram I read, there is a separate diagram for 2008 and upper model years. Peace! Well, I ended up having the dealer install 2 new air springs. Both failed the soap test. But the dealer beat my indy's price by a long shot. Car rides fine now, and compressor runs maybe for a second. I couldn't get an indy to do the springs, probably because of unknowns. Flat-out refused to do it. And I don't have the facility to do it myself. Just over $500 per side, which seems reasonable considering 89k miles, and the high-tech part (air bag!). If they last another 89k, I'll be really happy. Thread revival... For those have have done conversion from air bags to springs, did you also have to replace the struts/shocks? Looks like you guys just bought new springs. You don't need to replace them if they are fine. I replaced mine because they were shot... Real bad. I replaced them with the original spec shocks in the rear. I would imagine that if you have had issues for a while that the shocks were carrying the load of the rear of the car so they are probably shot. They are super easy to change even after doing the springs. You need to pull some interior plastic trim to get at the top nuts. I would estimate about 20 minutes a side including jacking and jack stands. ^^^Thank you! Pretty sure I am going this route. I plan to call a few indys tomorrow to see if they will do it. Does it matter if I go with the Benz ML Class or the Jeep springs referenced in this thread? Any +/- with either?